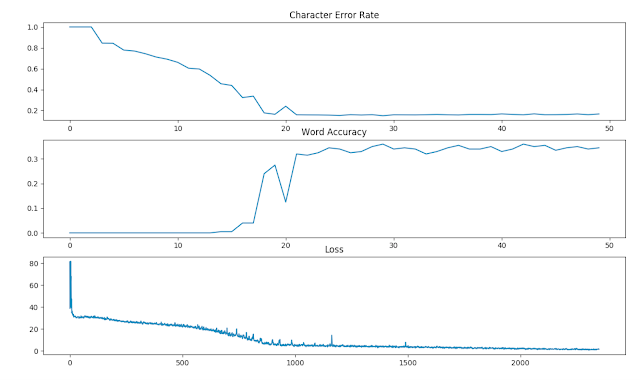 I trained a Tensorflow based CNN-LSTM-CTC model with 5.2 hours of Morse audio training set (5000 files) and achieved character error rate of 0.1% and word accuracy of 99.5% I tested the model with audio files containing various levels of noise and found the model to decode relatively accurately down to -3 dB SNR level. Decoding Morse code from audio signals is not a novel idea. The author has written many different software decoder implementations that use simplistic models to convert a sequence of "Dits" and "Dahs" to corresponding text. When the audio signal is noise free and there is no interference, these simplistic methods work fairly well and produce nearly error free decoding. Figure 1. below shows "Hello World" with 35 dB signal-to-noise ratio that most conventional decoders don't have any problems decoding. Figure 2 below shows the same "Hello World" but with -12 dB signal-to-noise ratio using exactly same process as above to extract the demodulated envelope. Humans can still hear and even recognize the Morse code faintly in the noise. Computers equipped with these simplistic models have great difficulties decoding anything meaningful out of this signal. In ham radio terms the difference of 47 dB corresponds roughly eight S units - human ears & brain can still decode S2 level signals whereas conventional software based Morse decoders produce mostly gibberish. I have been quite interested in Machine Learning (ML) technologies for a while. From software development perspective ML is changing the paradigm how we are processing data. In traditional programming we look at the input data and try to write a program that uses some processing steps to come up with the output data. Depending on the complexity of the problem software developer may need to spend quite a long time coming up with the correct algorithms to produce the right output data. From Morse decoder perspective this is how most decoders work: they take input audio data that contains the Morse signals and after many complex operations the correct decoded text appears on the screen. Machine Learning changes this paradigm. As a ML engineer you need to curate a dataset that has a representative selection of input data with corresponding output data (also known as label data). The computer then applies a training algorithm to this dataset that eventually discovers the correct "program" - the ML model that provides the best matching function that can infer the correct output, given the input data. 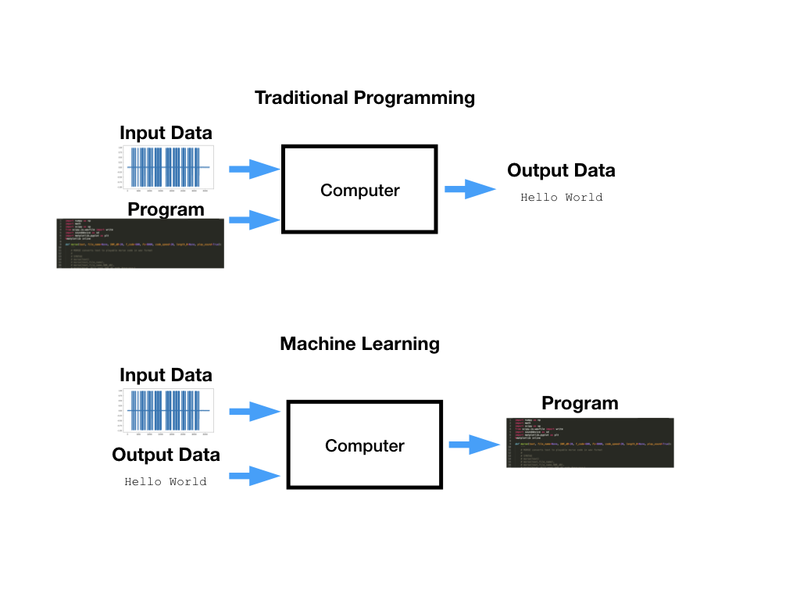 See Figure 3. that tries to depict this difference between traditional programming and the new approach with Machine Learning. So what does this new approach mean in practice? Instead of trying to figure out ever more complex software algorithms to improve your data processing and accuracy of decoding, you can select from some standard machine learning algorithms that are available in open source packages like Tensorflow and focus on building a neural network model and curating a large dataset to train this model. 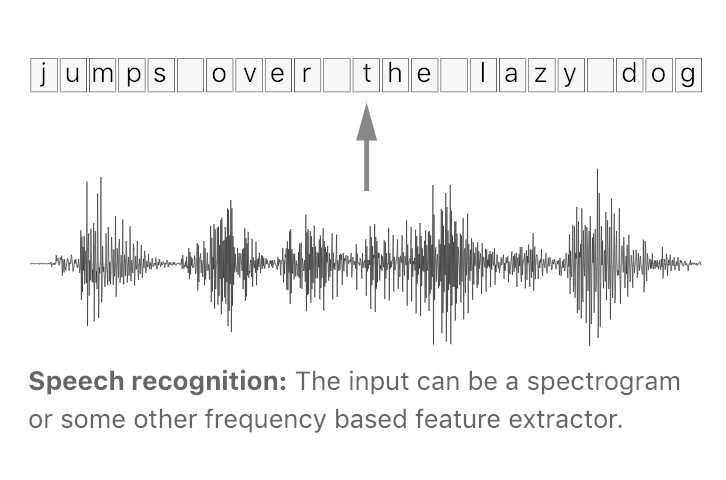 The trained model can then be used to make the decoding from the input audio data. This is exactly what I did in the following experiment. I took a Tensorflow implementation of Handwritten Text Recognition created by Harald Scheidl  that he has posted in Github as an open source project. He has provided excellent documentation on how the model works as well as references to the IAM dataset that he is using for training the handwritten text recognition. 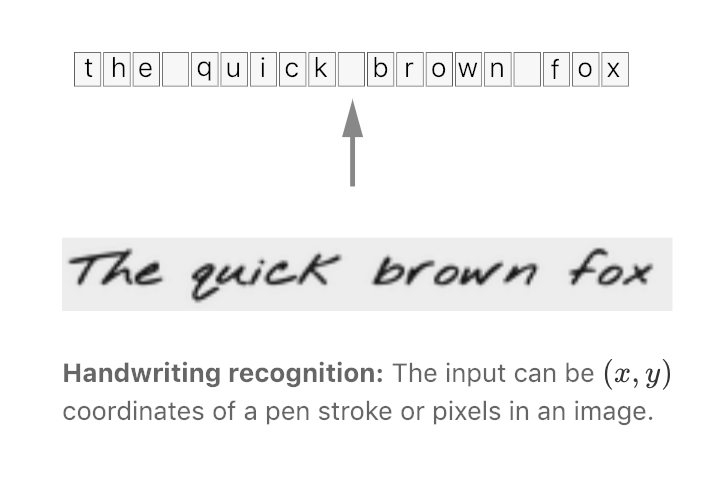 Why would a model created for handwritten text recognition work for Morse code recognition? 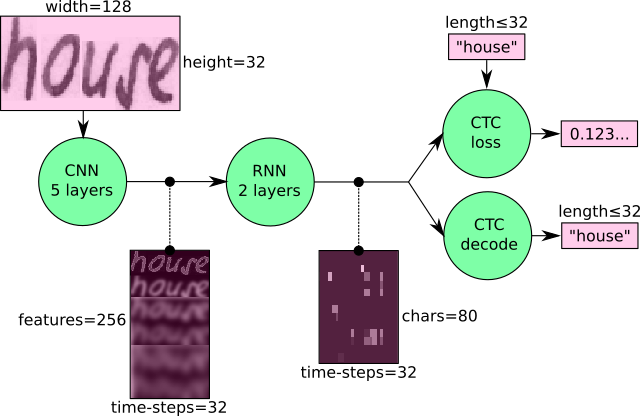 It turns out that the Tensorflow standard learning algorithms used for handwriting recognition are very similar to ones used for speech recognition. The figures below are from Hannun, "Sequence Modeling with CTC", Distill, 2017. In the article Hannun  shows that the (x,y) coordinates of a pen stroke or pixels in image can be recognized as text, like the spectrogram of speech audio signals. Morse code has similar properties as speech - the speed can vary a lot and hand-keyed code can have unique rhythm patterns that make it difficult to align signals to decoded text. The common theme is that we have some variable length input data that need to be aligned with variable length output data. The algorithm that comes with Tensorflow is called Connectionist Temporal Classification (CTC) . The Morse code audio file can be easily converted to a representation that is suitable as input data for these neural networks. I am using single track (mono) WAV files with 8 kHz sampling frequency. The following few lines of Python code takes 4 seconds sample from an existing WAV audio file, finds the signal peak frequency, de-modulates and decimates the data so that we get a (1,256) vector that we re-shape to (128, 32) and write into a PNG file. # 25Hz is a compromise - could this be made an adaptive value? Here is the resulting PNG image - it contains "ERROR M". The labels are kept in a file that contains also the corresponding audio file name. It is very easy to produce a lot of training and validation data with this method. The important part is that each audio file must have accurate "labels" - this is the textual representation of the Morse audio file. 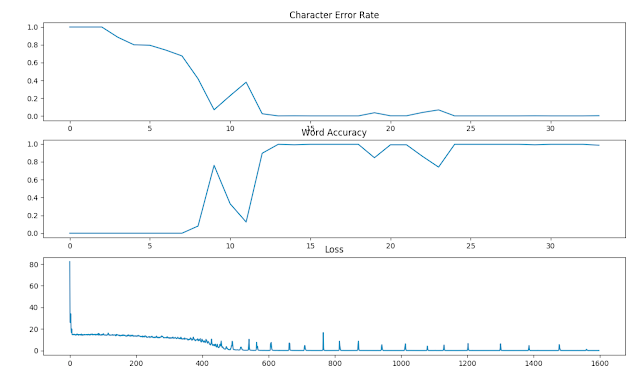 I created a small Python script to produce this kind of Morse training and validation dataset. With a few parameters you can generate as much data as you want with different speed and noise levels. I used Harald's model to start the Morse decoding experiments. It is not hard to imagine making some changes to the model to allow for longer audio clips to be decoded. Right now the limit is about 4 seconds audio converted to (128x32) input image. Harald is actually providing details of a model that can handle larger input image (800x64) and output up to 100 characters strings. The best character error rate was 14.9% and word accuracy was 36.0%. These are not great numbers - the reason was that I had training data containing 2 words in each sample - in many cases this was too many characters to fit in the 4 second time window, therefore the training algorithm did not see the second word in the training material in many cases. Character error rate: 0.1%. Word accuracy: 99.5%. With a larger dataset the training will take longer. One possibility would be to use AWS cloud computing service to accelerate the training for a much larger dataset. Note that the model did not know anything about Morse code at the start. It did learn the character set, the structure of the Morse code and the words just by "listening" through the provided sample files. This is approximately 5.3 hours of Morse code audio materials with random words. (5000 files * 95% * 4 sec/file = 19000 seconds). It would be great to get some comparative data on how quickly humans will learn to produce similar character error rate. I created a small "helloword.wav" audio file with HELLO WORLD text at 25 WPM in different signal-to-noise ratios (-6, -3, +6, +50) dB to test the first model. Attempting to decode the content of the audio file I got the following results. Given that the training was done with +40 dB samples I was quite surprised to see relatively good decoding accuracy. The model also provides probability how confident it is about the result. These values vary between 0.4% to 5.7%. 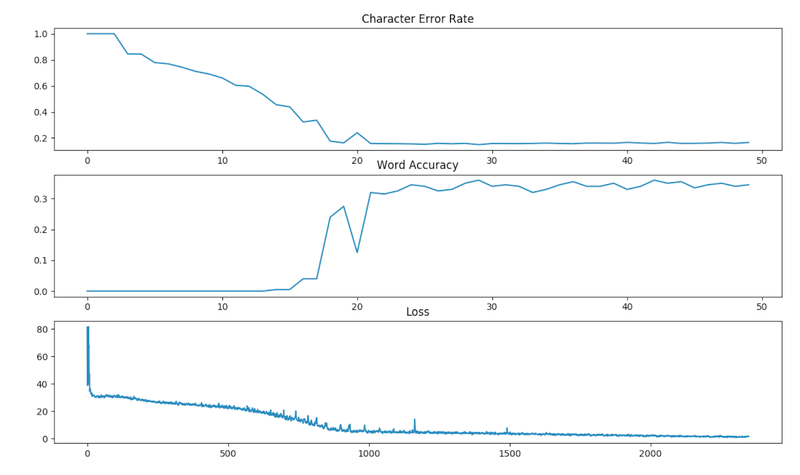 This is my first machine learning experiment where I used Morse audio files for both training and validation of the model. The current model limitation is that only 4 second audio clips can be used. However, it is very feasible to build a larger model that can decode longer audio clip with a single inference operation. Also, it would be possible to feed a longer audio file in 4 second pieces to get decoding happening across the whole file. This Morse decoder doesn't have a single line of code that would explicitly spell out the Morse codebook. The model literally learned from the training data what Morse code is and how to decode it. It represents a new paradigm in building decoders, and is using similar technology what companies like Google, Microsoft, Amazon and Apple are using for their speech recognition products. I hope that this experiment demonstrates to the ham radio community how to build high quality, open source Morse decoders using a simple, standards based ML architecture. With more computing capacity and larger training / validation datasets that contain accurate annotated (labeled) audio files it is now feasible to build a decoder that will surpass the accuracy of conventional decoders (like the one in FLDIGI software). To get started you need to generate audio training material. The count variable in model.yaml config file tells how many samples will get generated. Default is 5000. Next you need to perform the training. You need to have "audio/", "image/" and "model/" subdirectories on the folder you are running the program. thanks a lot for this very interesting article. Do you have some comparison on how much CPU power such a machine learning morse decoder needs in comparison to "traditional" decoders? Do you plan some plattform that can be used for average people for testing (e.g. re-integration in FLDIGI, or make a standalone application that can accept IQ samples)? Right now this is a standalone Python program mainly for experimentation purposes. I am currently running experiment where I train the model with different speed/SNR combinations of Morse audio files. A standalone application that would accept IQ samples may be feasible with some extra work; right now it only accepts 8 kHz WAV file samples for training and validation audio files. Integrating to FLDIGI may be feasible as Tensorflow does have C++ API, but I have not spent any time looking at that yet. In terms of CPU power the training obviously takes a lot of time and CPU power, whereas the inference should be significantly less. I haven't done any measurements yet but the Python code is in Github and freely available so such an experiment.